At Oaks Indian Mission in Oklahoma, Lutherans pondered what it means when a white person supports sports teams that use racial slurs as their mascots. 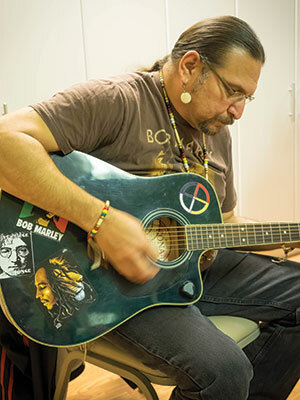 Many miles away at Living Waters Lutheran Church on the Cherokee Indian Reservation in North Carolina, visitors participated in worship that incorporated American Indian spiritual practices. Both of these groups were taking part in immersion programs hosted by ELCA American Indian ministries. The programs are “vital” to the life of the ELCA, given the world’s diversity, said Gordon Straw, ELCA interim program director for American Indian and Alaska Native ministries. “More and more immersion experiences are focusing on engagement. Doing service projects and providing clothes or food for distribution are still part of the experience but are less the focus in favor of a desire to learn about another sister or brother in Christ,” Straw said. At Oaks groups hear from Cherokee storytellers and participate in Indian sports. They eat together “and engage in activities to inform them about the past, present and future of native people,” said Meredith Harber, pastor of Eben Ezer Lutheran Church, located on Oaks Indian Mission. “They wrestle through the things that we learned in our history books and through current media that send a message about people that is incorrect. Will Peters shares songs about life on the reservation with immersion participants visiting Pine Ridge. Oaks Indian Mission hosts roughly five immersion groups per year. Some have come for 25 years. When people visit the Pine Ridge Indian Reservation in South Dakota, home to the Lakota, conversations focus on breaking down generalizations. Karen Ressel, pastor and director of the Pine Ridge Retreat Center, said alcoholism, domestic violence, suicide and unemployment are often what people think of when they first participate in the center’s immersion program. She helps people “unravel that one-dimensional view” to understand in a broader context what life is like on the reservation. Visitors hear from descendants of tribal members killed at Wounded Knee, visit a grassroots community development site and “learn how some Christian beliefs parallel native beliefs,” Ressel said. 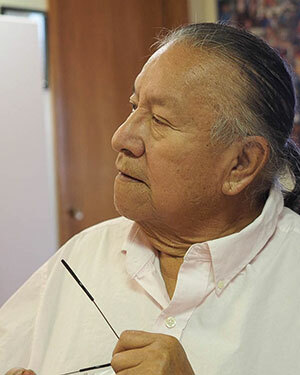 Leonard Little Fingers leads a discussion on history and culture with a group at Pine Ridge. At Living Waters, sage is burned as an act of cleansing before a liturgical service begins. The congregation then performs a Cherokee song and prays to the east, south, west and north. “We look skyward to the heavens and praise the creator for the beauty of his creation. … We give thanks for the earth,” said Jack Russell, pastor of Living Waters. The congregation then prays inward to cleanse their hearts and minds. Russell said the sage burning is similar to the Lutheran practice of burning incense, and the act of praying inward mirrors Scripture: “Create in me a clean heart” (Psalm 51:10). 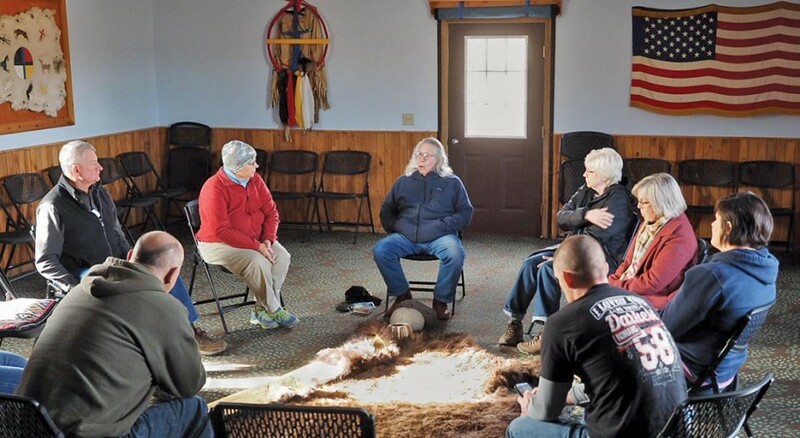 Immersion participants learn that spiritual practices are an important element of community on reservations. The immersion programs evolved within American Indian ministries that had relationships with congregations through mission or financial support. “Many of the groups are from congregations that already have a long-term relationship with ministries they visit,” Straw said. “Many who go on these immersion experiences come from quite a distance, concerned more with the strength of the relationship than with how far one must drive. That’s a critical lesson. A major challenge these ministries face is how to build trust among American Indians who have had a long history of being deceived and have had bad experiences with some church groups treating them as projects, not people. The immersion programs have helped break those barriers. Being asked to share who they are gives American Indians an opportunity “to speak their truth, and that’s healing,” Adelman said. Tribal member Earl Arkinson has spoken to some of the immersion groups at Rocky Boy’s Indian Reservation in Montana. His goal is to help break down stereotypes while sharing his beliefs. Loni Whitford-Taylor, another tribal member, said the tribe also benefits from the programs by learning about other cultures.